C.J. Massinburg took a few minutes after the University at Buffalo men’s basketball team’s 83-59 win against Ball State to reflect upon his three-plus years with the Bulls. 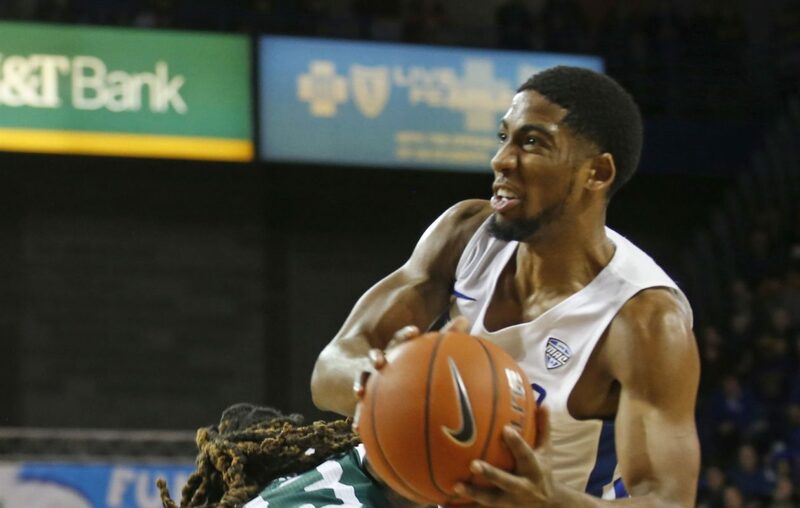 He went from a being a lightly recruited high-school player who had to beg Bulls coach Nate Oats for an opportunity to earn playing time as a freshman, to becoming one of the MAC’s top players. The senior guard became one of the Bulls’ top five all-time scorers Tuesday. His efforts helped UB move into first place in the MAC. The Bulls (19-2, 6-1) are a half-game ahead of Bowling Green in the MAC East Division and face the Falcons at 8 p.m. Friday at the Stroh Center in northwest Ohio. Massinburg scored 16 points against Ball State, on a night when the Bulls struggled to find their shooting touch, and moved into fourth among UB’s all-time leading scorers, with 1,715 points. Massinburg entered the game with 1,699 points and he needed 27 seconds to eclipse the 1,700-point mark. Massinburg hit 1,701 career points on the Bulls’ first basket, 27 seconds into the game. “It’s a blessing,” Massinburg said. “Me and Coach (Nate Oats) were talking about the recruiting process earlier today, at the pregame meal, and it’s just crazy how everything shaped out. Coach took a chance on me without even seeing me play, I came in on my visit and had to work out. Massinburg added four assists against Ball State and was one of four players in double figures in scoring for UB (19-2, 7-1 MAC) on Tuesday, along with Dontay Caruthers, who scored a season-high 21 points, Davonta Jordan (13 points) and Jayvon Graves (11 points). In fact, Caruthers deferred to Massinburg when discussing his own play. UB had to keep shooting, especially after a dismal first-half performance in which the Bulls shot 13-for-37 (35.1 percent) in the first half against the Cardinals (11-10, 2-6) – well below the Bulls' clip of 46.3 percent prior to Tuesday – and 2 for 19 on 3-point attempts. Defense became as pivotal as managing shot attempts for UB. Nick Perkins, who entered averaging 14.6 points per game, was held to a season-low three points against Ball State, but had five rebounds. Jeremy Harris went 2 for 10 for the floor and finished with five points, but grabbed 11 rebounds, including eight defensive rebounds. UB opened a 35-22 lead at halftime to 18 less than five minutes into the second half, and finished 32 for 74 from the floor, including 7 for 31 on 3-pointers. “If you have to rely on your offense, that’s a lot of pressure,” Oats said. “If you have to make shots to win every game, that’s not the kind of pressure I want to put on these guys. Our defense, that’s the kind of pressure we want to put on. That’s mental focus, locked in, playing hard, effort you can control that every night. Now, the Bulls prepare to face Bowling Green (14-6, 6-1) in a pivotal MAC East game; Bowling Green was idle Tuesday.